This tab of the Options deals with various IDE default fonts and fonts used by some dialogs, menus, etc. Default Fixed-Width: sets the value of fixed-font. 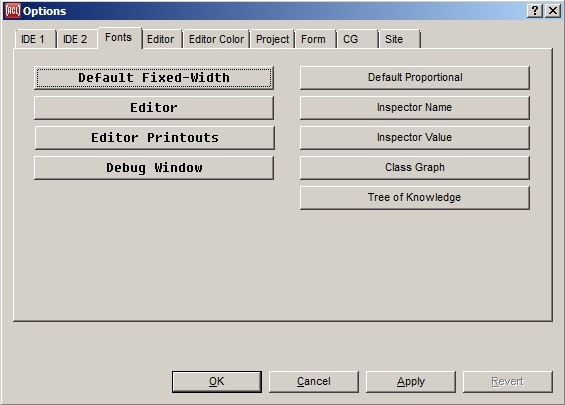 Editor: sets the value of editor-font, used in the Editor. Editor Printouts: sets the value of the printer-font. Debug Window: sets the value of debug-font, used in the Debug window. Default Proportional: sets the value of proportional-font. Inspector-name: sets the value of inspector-name-font used on the name side of Inspector windows. Inspector Value: sets the value of inspector-value-font, used in the value side of Inspector windows. Class Graph: sets the value of class-graph-font, used in the Class graphs displayed by, for example, the Tools | Graph Subclasses and the Tools | Graph Superclasses commands. Tree of Knowledge: sets the value of cg-tree-font, used in the Allegro Tree of Knowledge.